Bryan Lee O’Malley is running a Ramona Flowers costume contest (basically, go read for yourself [link] ) and I thought it’d be fun to do one of my own - and also use this as an example of a specific type of commission option I’m about to introduce this week. 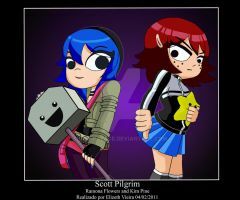 I like the Scott Pilgrim comics, but I have always specifically loved Ramona. I wish I was a fraction as cool as she is. Anyway, I chose to draw Ramona as a magical girl (you know, like Sailor Moon and stuff). It gave me an excuse to use lots of pink and aqua blue AND I got to draw a space background! So I’m totes happy. Enjoy, and wish me luck! Thank you! The design was not a winner, runner-up, or honorable mention, but that's okay. I'm glad you like it! Nice! I just finished mine. Good luck buddy! Nice. Love the see through effect of her coat and love the space background! OMG! game over ~ !